Here’s a nice little cross pattern that can be used for all kinds of ecclesiastical hand embroidery applications. The design is suitable for embroidery on a stole, for the top of a linen pall, for a book cover, on a baptismal gown, for First Communion gifts – really for any place where you’d like to embroider a cross. Any type of interpretation would work – you could use colored silk and gold, white-on-white, black-on-white, colored cotton threads, and so forth. You could just outline the pattern, or you could fill different parts, either with solid color, or shading. So many possibilities! Here’s a PDF of the pattern. It will print at about 6″ square. Interested in more church patterns? 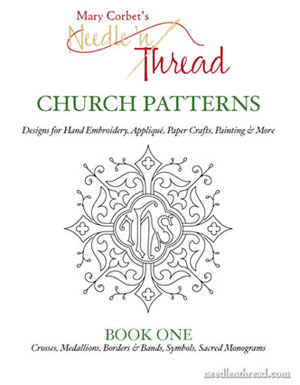 Check out Church Patterns: Book One – a collection of over 120 patterns suitable for church embroidery, and also for other arts & crafts endeavors (appliqué, paper crafts, painting – you name it!). Thank you! What a beautiful “Resurrection Day” post! Thank you for sharing this lovely cross. I am currently making an altar cloth for the chapel at my daughter’s college. It’s my first time doing this so I chose to use machine embroidery. Hopefully, I will have the chance to make another one and next time I will be brave enough to use hand embroidery. Hi,my name is Nici. Im very very new in my quest to try embroidery. I have watched a few youtube videos,purchased all the supplies and im excited. But, just a question for you…how would use the patterns? Do i print it and transfer? I dont know how to do this I am excited to learn how to do this. Beautiful past time. Next Next post: Hand Embroidered Monogram – Finished!